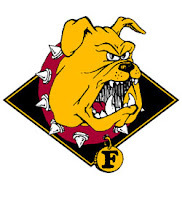 Last year's national runner-up Ferris State University kicked-off the 2012-2013 campaign with an 8-2 exhibition win at home over Ryerson University on Sunday afternoon. The Bulldogs began their scoring binge late in the opening period, when sophomore forward Nate Milam tallied an unassisted marker with 13:19 elapsed. Two minutes later, junior forward Garrett Thompson joined in on the action, finishing off defenseman Travis White's pass to make it a 2-0 affair. Senior forward and Ferris State captain Kyle Bonis made it a 3-0 affair with 2:02 left in the frame, with helpers being credited to linemates Travis Ouellette and Thompson. In the ensuing frame, the Bulldogs extended their lead to five following a pair of goals within a 22 second span. At the 3:09 mark, junior forward Justin DeMartino lit the lamp, followed by a score from forward Kenny Babinski. Midway through the second, tempers would flare between Ferris State's Eric Alexander and the Rams' Mark Corbett, resulting in game misconducts being assessed to both players. A penalty for too many men on the ice against the Bulldogs helped open up Ryerson's first goal, as David Searle scored on the man-advantage with a little over five minutes remaining in the stanza. 31 seconds into the final period, Ryerson shrank the deficit to three goals on a feed by Daniel Lombardi to Michael Fine that found its way past netminder Rob Grannett. The Bulldogs answered back shortly thereafter, as DeMartino banged in his second of the contest with help from freshmen duo Matt Robertson and Babinski. With less than two minutes left in regulation, Robertson made it a 7-2 affair after finishing off a feed from sophomore forward Justin Buzzeo. DeMartino beat Rams' goaltender Louie George with 22 seconds remaining to complete the hat trick. Earning helpers on that play were junior forward Andy Huff and Buzzeo. Ryerson's three goaltenders combined for 36 saves, led by Steve Gleeson's 16 stops in the second period. At the other end of the ice, C.J. Motte (10 saves), Charles Williams (five) and Grannett (11) each played one period apiece for Ferris State, with Motte earning the lone shutout. The Bulldogs open their schedule with a non-conference series this weekend when they travel to Troy, New York for a two-game slate against RPI. Puck drop for both contests is scheduled for 7:05 pm.